If we had to pick out the ugliest items in our house, the step stool would probably top the list. Typically an unattractive hunk of plastic or miniature-ladder-looking apparatus, these pieces are extremely functional (especially in New York where we have to build up), but not usually designed with style in mind. 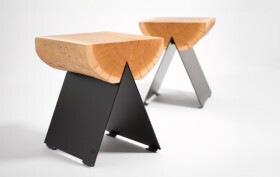 That’s why we love the 1/2 Stool by Malgorzata Knobloch and Igor Wiktorowicz of WITAMINA D. It’s an appealing combination of half a tree trunk and a technical, laser-cut metal base. And it’s certainly sturdy enough to endure the wear and tear of an urban abode.